There are so few films out there with substance. Unfortunately this isn’t one of them. I felt that this was more about Brad Pitt being eye candy and his involvement in numerous love making scenes than anything else. Pitt’s persona carried throughout the movie continuously which included a scene where the two protagonists meet in Casablanca and Pitt is dressed as if coming off the 1942 film set of the same name. Only Bogart can pull that off. I find it disheartening that film makers have to resort to shooting films using household names to capture an audience. I totally get the marketing aspect of selling the public, but it should not come at the expense of creativity. Billed as a romantic thriller I found no thrill, just romance and I use that term loosely. That said, in 1942, an intelligence officer (Pitt) in North Africa encounters a female French Resistance fighter (Marion Cotillard) on a deadly mission behind enemy lines. When they reunite in London, their relationship is tested by the nuances of war. This is Pitt's fourth World War II movie, following Inglourious Bustards (2009), Beyond All Boundaries (2009) and Fury (2014). 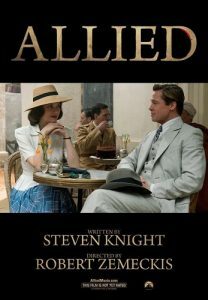 It is Cotillard’s second World War II film. The first was Lisa (2001). I suppose the pairing may have been intentional based on these facts but if so it was clearly a major error in judgment. August Diehl portrayed the character Hobar, a gambler and nemesis. He and Pitt appeared together in Inglourious Bustards (2009), and their scenes in both films also revolved around a game of cards. This scene in my opinion had no significance other than to remind how consistently this film was failing to impress me. Director/writer/producer Robert Zemeckis known for the Back to the Future trilogy and writer Steven Knight (2015s Burnt) just do not seem to be on the same page (pun intended). Their film genre history is completely opposite which would explain the drawn out plot and lack of connection between action and dialog. As with most films of this caliber there is most always at least one bright spot. That came in the name of Jared Harris (Adrian Sanders in 2015s The man from U.N.C.L.E) who was brilliant as British Officer of the S.O.E (Special Operations Executive), an agency created by Winston Churchill whom Pitts character also belonged. Regardless, the ending did not come soon enough.